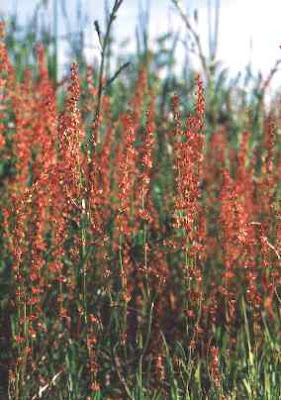 If anybody is dealing with Sheep Sorrel in their yard, you know it's not an easy thing to eradicate. When I researched online to find a natural way to get rid of this plant, I found a lot of comments like, "nothing works" and that was among the chemical herbicides also. Since it was growing right down in front of the property where it could be easily seen and complained about, we needed a natural solution. It grows faster than you can pull it since it sends out zillions of little rootlets. Besides, it's not a pretty plant since the flower is too tiny to see without a magnifying glass. The photo to the left shows how much it seeds, so we knew we had a big problem that we couldn't ignore. It's actually a great herb for medicinal purposes and you can use the leaves for salads (they have a zesty lemon flavor), but if you have Sheep Sorrel, you've got a lot of it because it seeds profusely and spreads by roots also. These plants also contain oxalic acid that is not beneficial if too many plants are eaten raw since oxalic acid interferes with mineral absorption. Cooking seems to destroy this chemical property. 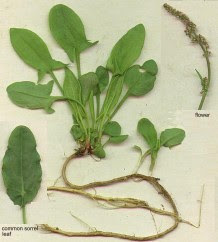 The plant is rarely more than a foot tall and has alternate leaves with arrow-like bases on the leaf. The plant is generally distributed in old fields and other disturbed areas of North America and Canada. The most important thing I read was that they grow on nitrogen-deficient soils. Aha! So, why not put some nitrogen into the soil so it would not provide such a great habitat for it to grow and spread!? Would that be the solution? The delight of it all was that we had moved a bunch of cedars and pines on that bank to provide a cover area for the birds since we had hardwoods on the property. So, adding nitrogen (ammonium sulfate) to the soil around these trees where the Sheep Sorrel was growing would only benefit the trees. It was worth a try. We pulled out as much Sheep Sorrel as we could get our hands on above the soil and the roots below the soil and then spread the nitrogen, made sure it was dug into the dirt, and let it go. This year the area we did was totally free of Sheep Sorrel except for a few small babies which would've come up from seeds. We pulled those in the Spring and it stayed clear for the entire Summer. We are now working on another area where it's growing around forsythias. 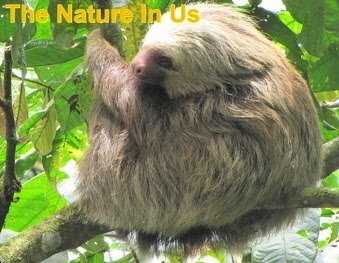 How cool to find a solution that's natural and beneficial! If anybody else has tried this please make a comment. I would love to know that it's worked for others also. Sheep Sorrel is considered an invasive plant which means it will crowd out other natives that are important for biodiversity and wildlife. The photo to the right shows you the shape of the leaf. Since it's pretty unique among plants, it's an easy one to identify. Thank you so much for sharing, James! There's a blog post made this month where I asked folks to share their healing stories. You may want to share details of yours so others can benefit. This is great to hear! I'm battling a huge sorrel infestation in my yard right now. It's taken over a large area of grass. I'm trying to avoid chemicals, and you're right, nobody has any real suggestions, except you. Just to be clear, did you hand pull the plants, or did you use a fork or shovel to get to the rhizomes? I'm using a shovel because the area of sorrel is so large, but I'm concerned that since it's flowering I might be pushing seeds into the ground and setting myself up for a worse problem. Thanks so much for sharing! Thanks, Teresa! Let me know how it goes for you!